April 26th, 2002. This webpage is going to be updated over the next few weeks. Air India 182 crashed into the Atlantic Ocean near southern Ireland on June 23, 1985. This picture was scanned in from the Toronto Globe and Mail dated March 22, 1997 which is part of a very long article by Timothy Appleby. It describes the theory that certain Sikhs from India were involved with the destruction of Air India 182. 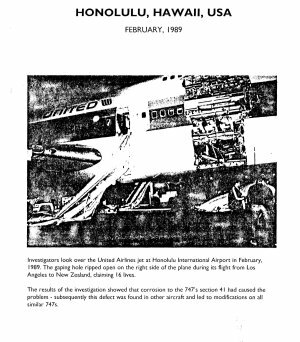 The author has studied the documentation from many sources and concludes that the real cause of the crash was the same as the other Boeing 747 of early vintage. In my book I describe how this accident could have been caused by metal failure. This plane was not as old as Pan Am 103 or TWA 800 but you will see evidence of the problems in my book. Air India 182 was the 330th plane off the assembly line and was a newer model, the Boeing 747-200B, but it would still have been necessary to make the recommended modifications had it survived long enough. Read about the interesting story of how Section 41, which was five miles closer the departure point, was lost during recovery. The wreckage is in very deep water; 6700 feet. According to the accident report the plane was 317,877 kilos on take-off and it was estimated it would weigh 237,177 kilos when landing. The maximum landing weight for this aircraft was 256,279 kilos so the plane was flown in excess of 93% of its maximum load capacity. After take-off, the plane weighed approximately 24% higher than the maximum landing weight. One might question the effects of the loading stresses in turbulent weather. Normally, planes are designed to withstand weather related stresses, but if the airframe happened to be less robust than expected, a mid-air disintegration might well be possible. These additional stresses on the plane's structure could have taken place in areas where problems were anticipated to occur after several more years of additional flying and cycles. Read what is said in my book, "Plane Truth. An investigator's story>"
Only approved information will be added to this page. The RCMP has conducted a very long and expensive investigation of this air disaster. They are, however, aware of my own investigation. This information was received on April 12, 2001. 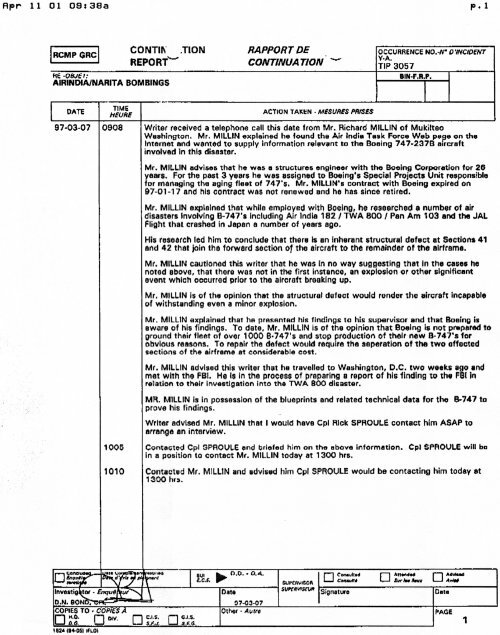 Mr. Ed Bollier, who was accused of manufacturing the timing device which brought down Pan Am 103 (see his website on the Pan Am 103 webpage herein) told me of the same data and gave me copies of emails from Mr. Millan. Check out page 113 in my book. 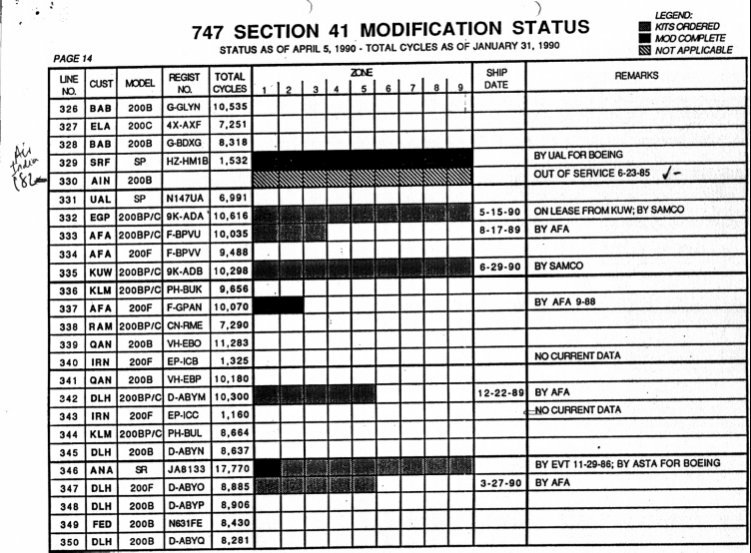 This document makes it even more clear that there was a structural problem with these older planes; at the least it is corroborating data. Click image to enlarge and weep. This is a picture of United Air lines that lost a large piece of Section 42. This plane managed to land in Honolulu and was repaired. Click picture to enlarge. Does this picture appear similar to the one above? This table shows that Air India 182 was on the list for repairs and modifications. Thank you for visiting this webpage. You are visitor no.